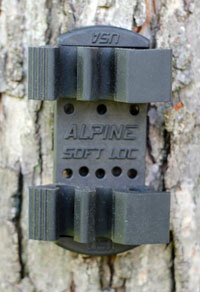 The Soft Loc Quiver system is made by Alpine Archery and hit the market back in 2001. The Soft Loc Quiver has had and still has advantages over the competition due to an excellent design. Lets look at what makes this quiver one of our favorite quivers of all time. The mounting system of the Soft Loc Quiver is made of soft, noise dampening rubber and mounts to a compound bow via two allen screws. The Soft Loc Quiver’s frame locks into the soft rubber with a little pressure resulting in quiet attachment and detachment to and from the bow. When the quiver is detached from the bow, the rubber mount absorbs noise causing vibration, aiding in achieving a quiet stealthy shot. After talking to a couple of representatives from Alpine Archery, I discovered that this system is going to be replaced by a similar system used in their Power Loc quiver. I don’t quite know what to think of this, but they assure me its going to be even more of an improvement. I hope so! The design of the Soft Loc Quiver was ahead of its time when it was introduced into the marketplace. If you intend on shooting mechanical broadheads, having a quiver that grabs the arrows in two spots is essential. When the arrows are grabbed in two spots, you can remove the foam inside the quiver’s head to allow your mechanical broadheads to be protected by the quiver’s head but not rammed into a piece of foam. When mechanical broadheads are only held in place by one grabber and a piece of foam, it is a recipe for disaster. 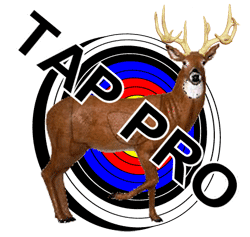 This is due to the insertion of the broadhead into the foam, which of course, simulates the same action which deploys the blades when an animal is shot. Premature deployment of blades in this manner will wear out a mechanical broadhead’s locking mechanism (o-ring, clips, collar, bands, springs, etc.) and can lead to premature blade deployment while an arrow is in flight. The Soft Loc Quiver comes with many options. Archers can choose between a 3, 5, and 7 arrow quiver as well as a variety of camo patterns. The current available camo patterns are Mathews Lost, Mathews Lost AT, Mossy Oak Infinity, Realtree APG HD, Realtree Xtra, Skulz, and black. 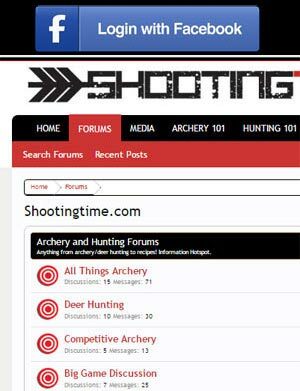 This wide variety of options ensures that no matter what bow your are shooting or what you are hunting, you should be able to find a combination that is right for you. The boys over at Alpine Archery hit a homerun with this quiver. From the quality of its build to its excellent design, it will surely stay on our bows until it’s discontinued. We give the Alpine Archery Soft Loc quiver a 9 out of 10 star rating.